“Our students just don’t know how to write well anymore,” states the frustrated teacher. The resource of “They Say, I Say” by Graff, Birkenstein, and Durst offer some specific strategies and templates to help guide our students in how to write academically. By using any of these templates below consistently in class, students will begin to internalize the format to help support their academic writings. On the one hand, __________. On the other hand, __________. Author X contradicts herself. At the same time that she argues __________, she also implies __________. I agree that __________. She argues __________, and I agree because __________. Her argument that __________ is supported by new research showing that __________. Americans today tend to believe that __________. Conventional wisdom has it that __________. My whole life I have heard it said that __________. I have always believed that __________. When I was a child, I used to think that __________. In fact, they celebrate the fact that __________. In her book, Book Title, X maintains that __________. X complicates matters further when she writes that __________. I think that X is mistaken because she overlooks __________. I disagree with X’s view that __________ because, as recent research has shown, __________. X overlooks what I consider an important point about __________. I wholeheartedly endorse what X calls __________. My discussion of X is in fact addressing the larger matter of __________. These conclusions will have significant applications in __________ as well as in __________. Graff, Gerald and Cathy Birkenstein. 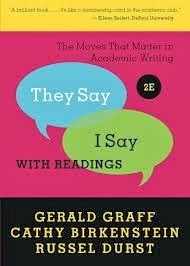 They Say/I Say: The Moves That Matter in Academic Writing. New York: Norton, 2006.